HURRY! ENTIRE BUILDING of Brand New Condominiums is SOLD OUT except unit #3B and lucky for you, it is back on the market! Two bedrooms Two Baths, Open Floor Plan Living room, Kitchen, Dinette, Private Balcony and Roof Terrace. Apartment 3B has 1206 square feet of living space and has a laundry area, an On-Demand heat and hot water system, recessed lighting, beautiful Oak wood flooring, and is Cable ready. The new kitchen has Quartz countertops and stainless steel appliances. Located in the Sheepshead Bay area (Avenue U and Nostrand Avenue) near all stores, restaurants, transportation, and area schools. DONT' WAIT TO CLAIM THIS AMAZING BRAND NEW APARTMENT FOR YOURSELF BEFORE IT IS GONE! 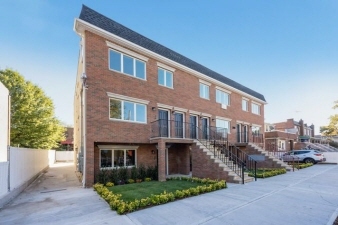 Additional Features and Amenities Located in the Sheepshead Bay area (Avenue U and Nostrand Avenue) near all stores, restaurants, transportation, and area schools.